It definitely has been a cold one here the past few days....I think I have add enough of winter!! Is anyone else ready for spring yet? 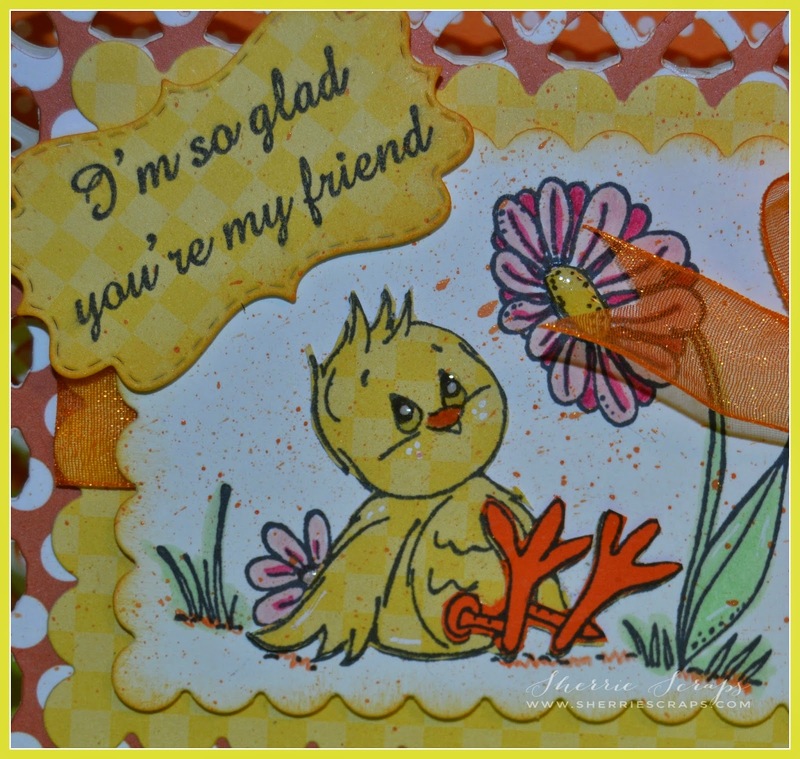 Today I have a spring like card to share with you using some darling stamps from Great Impressions. I started with the Spellbinders Lattice Rectangle for a pretty base and base layer. The pattern papers are from Simple Stories and Lasting Impressions. I followed with Spellbinders Classic Scalloped Rectangle and another one that I stamped the image onto. I distressed the edges with TH spiced marmalade. I had won a $20 shopping spree at the Great Impressions Store for winning the January challenge. So, I picked up this adorable image called Sweet Chick~G499 along with some other awesome stamps which I will share soon. I colored it with copics and paper pieced some for dimension. I used my Wink of Stella pen to give it a little sparkle to. Isn't this chickie just the cutest? The sentiment is stamped with My Friend B181~also from Great Impressions. I splatted a little Peach Delight glimmer mist on the image and finished with a fun satin bow using ribbon from my stash along with a paper flower in the center. Oh this is so super cute!! Great coloring my friend, it looks awesome!! Well, we made it home from our Caribbean vacation...kicking and screaming! I sure didn't want to come home :( lots to do here at home and bloggy catch up. I hope you had an awesome week and try and stay warm my friend!! I am right there with you in wanting Spring to be here yesterday! It seems like an incredibly long winter! 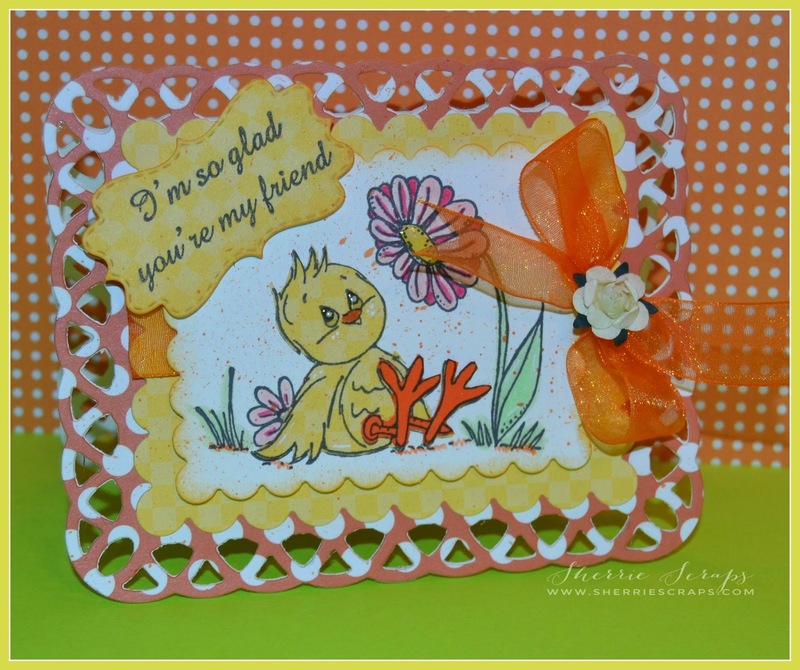 Your sweet Little Chick card is darling and it yells Hello Spring! 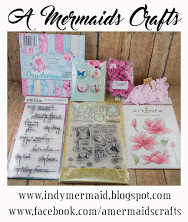 I love that Spellbinders Lattice Rectangle die and the Splatter! 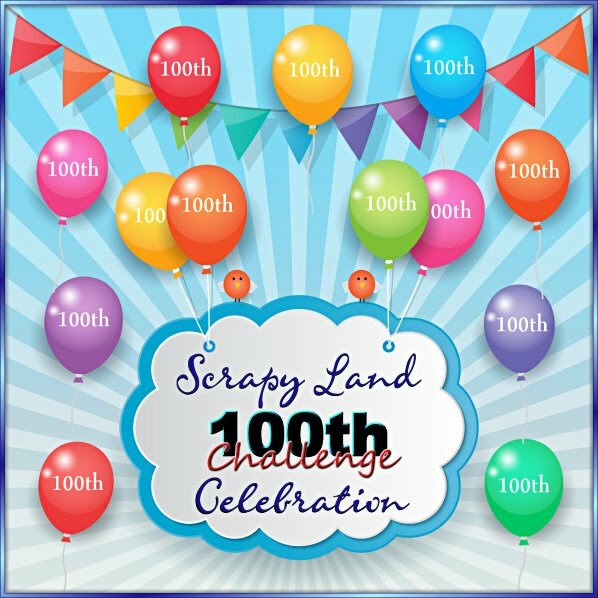 Thanks for playing along with us at Scrapy Land Challenge #12! What a sweet card! 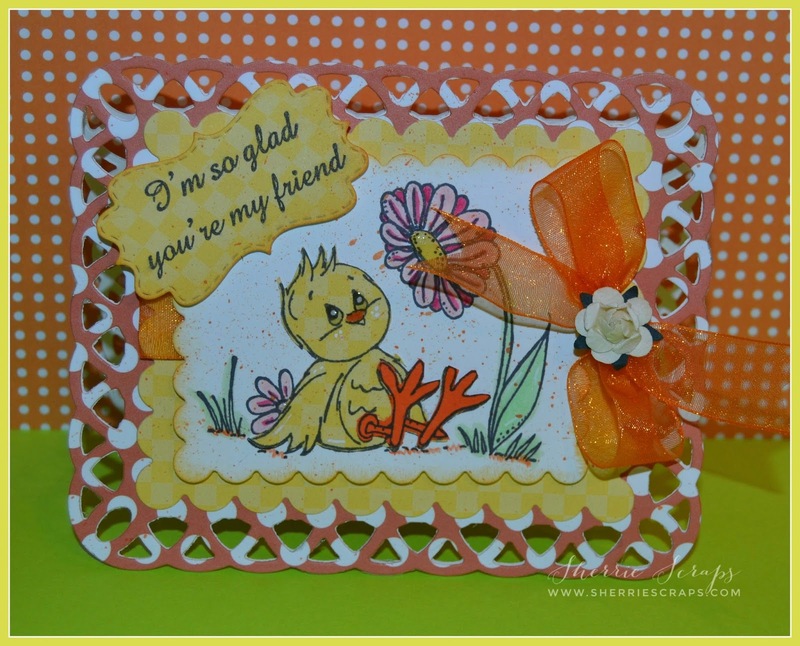 That little chick is super cute and I love the scalloped card base - very pretty! Stay warm my friend - we are having a rainy, yucky day here today. Spring is just around the corner though so hang in there! I forgot to thank you for playing along at Scrapy Land!! Hugs!! Very sweet card, the image you used is adorable! The card design is so beautiful, love the scallops! You're winnings paid off! What an absolute adorable card! Yes I have had enough of winter and ready for spring! Thanks for the darling image to fetus ready! Congrats on the winnings!! this is such a cute card, love the sweet image! Oh gosh!! You did an Awesome job on the coloring! Adore the cute chick and fun sentiment. You know I love the gorgeous bow my friend!! Such a precious card, gr8t card base too! This is sooooooooooo cute! I love love love the ribbon and that adorable chick!!!!!! This is adorable !!! I love the image and entire design !!! Lovely card, great image and layout. Thanks for joining in with us over at myshericrafts this week. Congrats on your shopping spree win!! hehee.... they have great stamps at GE .... and your card is soooo cute!!! Love the papers and that cute little chick! OMG cuteness OVERLOAD Sherrie!! 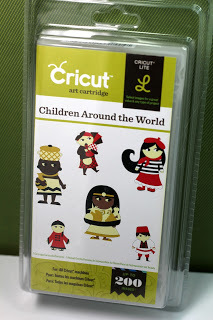 Love that adorable stamp and the card design, colors and embellishments are perfect! Such an AWESOME card my friend!!! Oh my gosh, this is the cutest card EVER!! Love everything about it Sherrie!! And that chick is so stinkin' CUTE!! Fantastic!! Oh Sherrie ~ this is so STINKIN CUTE!! I LVOE that image, which you colored PERFECTLY, then the whole frame/base!! Oh my word!! BEAUTIFULLY done! I am so O.V.E.R. winter ~ broken pipe, driveway is an ice rink, water main breaks ~ the whole nine yards ~ spring is just around the corner and your card reminded me of that! What a adorable card!! Love the sweet image you used!! Have a great day. Super cute card Sherrie! That little chick is so darling! Love all the layers! This is adorable and I love the color choices. Love the idea of stamping your sentiment onto patterned paper too. So glad you shared it with us for the Scrapy Land Challenge. Sherrie, this card is just so pretty! I love the color combination you used! Such a cute card. Love the little chick and his shinny eyes. The papers are fabulous as well as the beautiful bow. This is super Sherrie, I love that cute little scene with the chick! So sweet!! Such a sweet and pretty card! I love the spring colours. I am SO ready for spring too!! Thanks for joining the challenge at Craftin Desert Divas! Hey Sherrie! How have you been? It has been awhile. I do hope things have been well with you and your family. We have had such a crummy winter. I love your card it is so cute and colorful. Fabulous ideas and great inspiration. 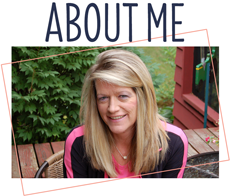 Congratulations on your win, Sherrie! It's always fun to create with treasures you've won, huh! I love the polka dot paper on the latitice here, such a cute background for that adorable little image. This is so cute and full of spring. I'm hoping you get some warmer weather soon...it is after all, MARCH! Have a happy week! This is adorable!! I love the lattice card base! This chick is too adorable and the warm colors you used are wonderful! Thanks for joining us at My Sheri Crafts. So stinking CUTE! Bright and cheery too! Thanks for linking up with us at Anya, Oddies, and Others!